Since we last checked up on One Clinton Street, back in late August, it was only about nine stories above street level. Now, the 36-story residential tower is climbing past the halfway mark on its way to a 409-foot pinnacle. The Marvel Architects-designed skyscraper is being developed by Hudson Companies, and will span 295,000 square feet when finished. The triangular-shaped property sits at the northern confluence of Cadman Plaza West and Clinton Street, and is also known as 280 Cadman Plaza. 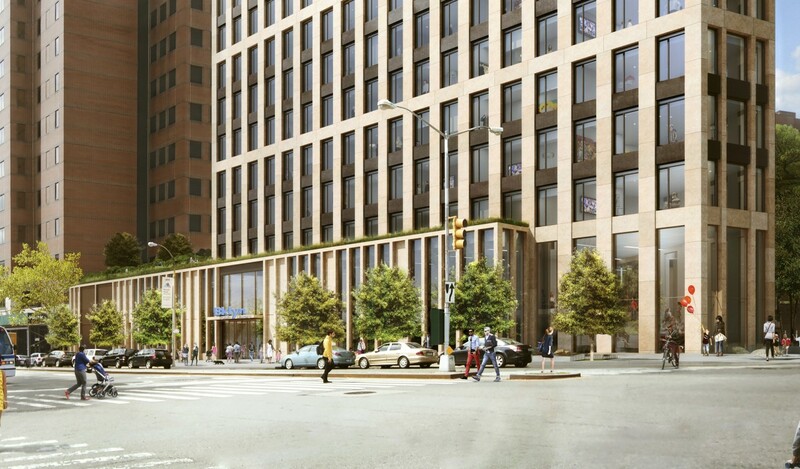 Located in Brooklyn Heights, the building will have 134 units and 114 off-site affordable units. One Clinton Street Library will be built on the lower floors, replacing the site’s formerly extant Brooklyn Heights Library. Looking at the construction site, the entire structure is being built with reinforced concrete featuring eight structural concrete columns on each wide flank of the triangular-shaped building. In between, secondary perimeter columns have been built from large cinder blocks that form and divide the distance between the original concrete columns. This breaks up the facade into a total of 18 openings that will hold and support each of the 18 windows that line the eastern and western faces. The facade will cover and disguise the additional exterior columns with vertical light-colored panels that visually divide the building into sections of two and three floors, breaking up the large eastern and western frontages. On the ground floor, The Brooklyn Roasting Company will partially occupy the retail section, along with Smorgasburg-selected pop-up food vendors. These will share the same floors as the new library and STEM research center, which will take up about 9,000 square feet. One Clinton Street will top off sometime early next year, with completion and opening of the building expected sometime around 2020.